TOPELE emt steel couplings are used to connect the ends of two unthreaded EMT conduits together. 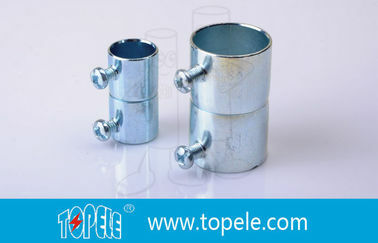 TOPELE EMT steel set-screw couplings provide concrete tight connections when taped. Additionally, these set-screw couplings eliminate the need to thread bald conduits to fit old threaded couplings. EMT steel couplings are steel and with zinc-plate surface for excellent corrosion protection in damp location. Three-way combination screws for flat-blade, philips and square head screwdrives 1/2" through 2"
Slotted hexhead screws 2-1/2" through 4"
2-1/2" throught 4" rated for threadless aluminum RMC and steel IMC.